The winter season has finally set in, and the relatively cooler temperatures are the perfect opportunity for a new set of colors and styles in your garden. With the days cooling off, our hot and tropical weather blooms are taking a rest while we take advantage of the mild temperatures to bring gorgeous winter annuals home to our gardens. The winter season officially starts on the calendars in December, but the cooler late autumn weather is the ideal time to start thinking about rejuvenating your garden with some fresh blooms. Our winter weather is similar to the conditions that some of our northern neighbors see in their spring and early summer, so it’s the perfect time to take advantage of seasonal temperature lows to appreciate some of our favorite flowers. Maintaining a beautiful garden all year comes down to timing in South Florida. Although we don’t find ourselves racing the clock to harvest vegetables and appreciate blooms before frost, our gardens experience a different kind of fatigue from blooming all year. Our summer blooms are known for their tropical and exotic flair, soaking up the intense heat on our hottest days. These flowers will be winding down for a rest at this time of year, and your garden will need an infusion of color and energy to look its best. Plant your winter flowers now to make the most of them – you don’t want to plant too early when they’ll be exhausted by the early autumn heat, spoiling the show for the rest of the season. By being cautious about heat when planting and waiting until the weather is cool, your winter blooms will be set up for success and ready to dazzle all season and well into the spring. These beautiful blooms are great selections to plant now at the very beginning of the winter weather. They can tolerate a bit of heat and will make wonderful and colorful transitions from your summer blooms to your winter garden. Begonias: While treated as an annual in northern climates, these popular blooms are actually hardy enough in warm climates, like ours, to be a staple in your garden to rely on for a gorgeous display every year. Although they don’t have quite the nuanced variety in color choices as some of their other designer blooming companions, they offer such a rich saturation of pigment in each bloom that many gardeners still have a hard time choosing which is their favorite to plant. Kalanchoe: These vibrantly colorful flowers are a great choice for a spot in your yard where they are on full display in the sunshine. You can coax these flowers into giving you more and more all season by cutting them back after they finish blooming, encouraging them to rebloom again for your enjoyment. If nursed through the hot days of the summer, these flowers may actually become a perennial in your garden! Add a little touch of fertilizer and cut back your flowers as fall approaches to coax them into a rejuvenated cycle of color for the winter. Alyssum: These sweet, white or purple flowers are popular in the more northern states but often overlooked in Florida, making them a unique flower to accent your garden. They are an ideal choice for borders around gardens or paths where you can enjoy their dainty blooms. New Guinea Impatiens: While many varieties of Impatiens are stunning and popular options for your garden, none have quite the impact like the New Guinea Impatiens. Rich, deep green or burgundy foliage contrasts with gorgeous blooms to make this an easy favorite in your garden. With so many colors to choose from, they are the perfect fit for any style and design. Sunpatiens: A newer variety, we’ve been absolutely thrilled at how well it has performed in our unique South Florida climate. These breakthrough blooms seem to have everything: big flowers, continuous color, and a hardy growing habit that makes them a great selection for many different places in your yard. Dianthus: Dianthus are sometimes known as “pinks” and even from across the garden you can see why. These flowers belong to the same family as carnations and have a familiar, but more dainty and sophisticated shape. Their enthusiastic coloring isn’t the only thing that catches attention with these blooms, though, as they have an intoxicating cinnamon and clove-like fragrance that sets them apart in the garden. Our favorite dianthus variety is Jolt pink which won awards for its showy style and pink hues that will grace your garden through the entirety of the winter season and well into the spring. Best saved until the weather is sure to be cool, these flowers can’t be forgotten in your winter season planting. Geraniums: This classic flower is a staple of gardens everywhere, and the South Florida winter season is the best time to enjoy it in your own garden, too. The lacy layers of petals on these flowers simply beg for you to reach out and touch. 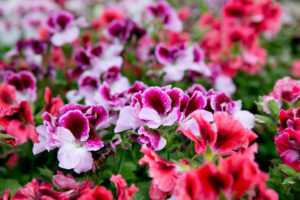 Petunias: A great choice that offers endless color selection. A northern favorite, we benefit from a list of designer blooms available that will grow quickly and burst forth with color and life. Winter is a time of opportunity for your garden, not a time of hibernation and wilting blooms. The cold weather is the perfect time to add new colors and designs to your garden that you don’t have the chance to enjoy fully the rest of the year, helping your garden transition from season to season with style.